We're pleased to announce that we will be hosting local author Tricia Springstubb as a storytime reader on the Saturday of Children's Book Week, May 17. Ms. Springstubb, a Cleveland resident and book critic for The Plain Dealer, will be in the store from 11 AM to noon reading her favorite children's book, Sylvester and the Magic Pebble by William Steig. Bring your children for this wonderful event in support of reading and independent bookstores! Last week was Banned Books Week. Throughout the USA, for various reasons, all kinds of books are banned in schools and in libraries. We here at BookPeople embrace all kinds of literature – banned or not! To celebrate, our storytime today will include only banned books – including Sylvester and the Magic Pebble and other 'controversial' picture books. Hooray for Freedom of Speech! William Steig , Abel's Island. 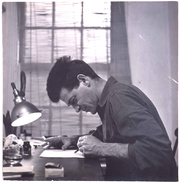 William Steig is currently considered a "single author." If one or more works are by a distinct, homonymous authors, go ahead and split the author. William Steig is composed of 12 names. You can examine and separate out names.